Gutters accumulate a lot of debris, mostly leaves and twigs that will inevitably cause clogs and overflows. Standing water in the gutters can penetrate under the tiles and may cause damage to the main structure of the roof including the fascia and sub roofing. Overflowing gutters can also cause water to run down external walls causing major damp issue internally to your home. All of these issues are very expensive to put right if not dealt with promptly. 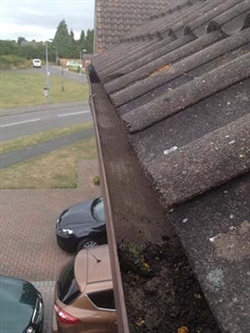 Prevention is better than cure when dealing with gutter maintenance and to assist you Falcon Maintenance offers the complete gutter-cleaning package for residential and commercial properties in Ipswich, Suffolk and Essex and the surrounding area. Health and safety for our customers and employees is always our priority. With this in mind, we have invested in the state of the art gutter cleaning equipment that enables us to carry out most of the cleaning process from ground level. 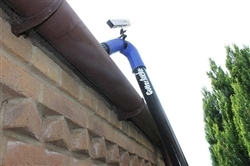 Our specialised vacuum cleaning system utilises a camera that ensures our cleaning operatives can see exactly what is happening at the point of cleaning in the gutter above. This advanced system enables us to deliver a gutter cleaning process that provides an effective solution, leaving our customers with the peace of mind that a professional service has been delivered. Falcon Maintenance – Advanced technology for access to those hard to reach areas. Blockages can build up anywhere in gutters, and this more often than not occurs in the most awkward places to reach. An example of this is over conservatories, which can cause many problems during the cleaning process, including damage to the existing conservatory. Falcon Maintenance can avoid any such risk to our customer properties by employing our advanced cleaning equipment. This equipment includes super lightweight carbon fibre poles which enables easy and safe access to all problem areas. This advanced process means that time on site is managed efficiently; there is no need for scaffolding, thus resulting in a very cost effective gutter cleaning service for our customers.